Swimming is a popular activity in Florida, enjoyed by residents and tourists alike. Water safety is critical, and while the far majority of people who swim are able to enjoy the activity without incident, some are involved in devastating accidents. Here are three swimming pool accident facts and what you should do if you or a loved one have been the victim of an incident at a swimming pool. Millions of people enjoy swimming every year in Florida, so it’s no surprise to learn that swimming pool accidents are common. What is surprising is the fact that there are more swimming pool drowning deaths in Florida than in any other state in the U.S. Florida Health reports that in 2010, the state had the highest unintentional drowning rate in America with 7.29 drowning deaths per 100,000 people. Additionally, in 2010, Florida had the highest drowning rate in the nation for children aged 1-14, with 2.67 drowning deaths per 100,000. Most people imagine swimming pool accidents being caused by slipping on a wet surface and falling onto the pavement or into the water. However, there are actually several causes of swimming pool accidents, any of which can lead to critical injuries or death. Swimming pool accidents can be caused by the lack of a safety gate in areas where children play, low water levels, negligent supervision from a lifeguard on duty, and broken glass in or around the swimming pool. In some swimming pool accident cases, the cause of the accident resulted from the carelessness or negligence of another individual. For example, if your child drowned at someone’s home due to the lack of a safety gate around the pool, you may be able to hold the homeowner responsible for material and emotional damages that resulted from the drowning. Accidents that do not result in death, such as a getting cut by broken glass on the ground at a public swimming pool, may also be eligible for compensation through a premises liability claim. 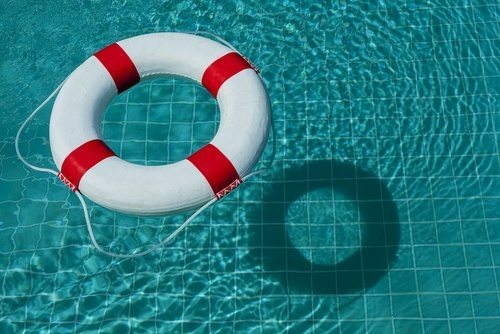 If you or a loved one were involved in a swimming pool accident in Florida, it’s critical that you reach out to an experienced swimming pool accident attorney as soon as possible. At the Slonaker Law Firm, we understand how devastating swimming pool accidents can be, and we are committed to providing each of our clients with compassionate and zealous legal representation. Contact us today for a consultation to discuss your case in detail by calling (352) 629-6656 or toll free at (888) 629-6656.